Dr. Doom’s Fearfall is one of the best “beginner” thrill rides at Islands of Adventure. You must be 52 inches to ride this ride so anyone under the age of around 9 will probably not be tall enough. Dr. Doom’s Fearfall is two 199 foot towers which sit by side by side and each ride seats 16 guests seated in rows of 4 which all face outward. If you are a real thrill seeker, you may be a bit unimpressed by the actual thrill level of this ride. The anticipation of when you will be launched into the air is much worse than the actual ride itself. You are taken on to the ride and strapped in with your feet dangling. Then you wait as everyone is secured. After this, you are sitting and waiting and there are no indications on when the ride will shoot you up in the air. In a fraction of a second, the ride shoots you up over Islands of Adventure where you can see the entire park. You do get that wonderful rush and tickle in your stomach so you don’t want to miss this ride. The best thing about this ride is that it offers amazing views of the park. There is a single rider line available, which goes much faster, if you don’t mind riding with people you don’t know. There is also the “Rider Swap” option so if you have a child who does not meet height requirements, you can all wait in line together. Just let the attendant know that you would like to do the “Rider Swap” and they will accompany you to the waiting area. 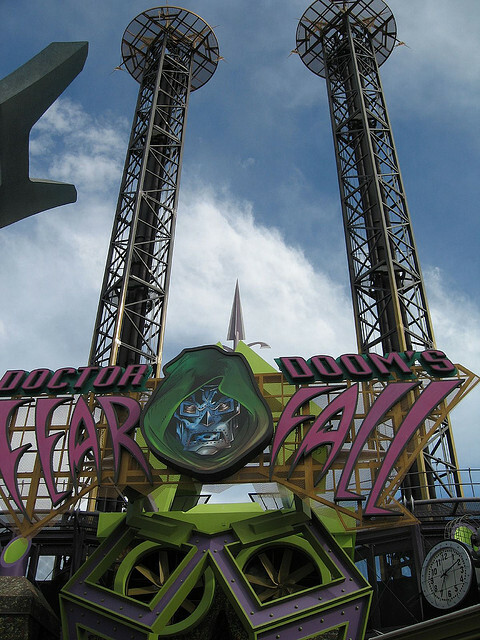 So, next time you are at Islands of Adventure, stop by Dr. Doom’s Fearfall for awesome thrills and park views.